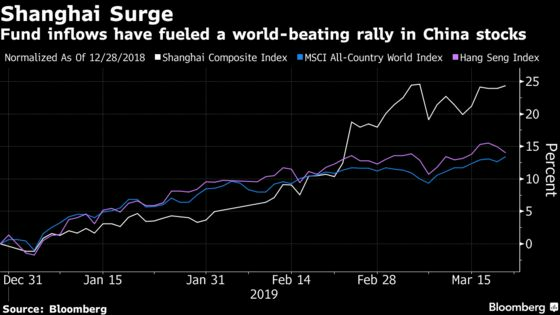 (Bloomberg) -- It took just 10 hours for a star Chinese stock picker to attract more than 70 billion yuan ($10 billion) of orders for his new firm’s debut mutual fund, the latest sign of investor exuberance in the world’s best-performing equity market. The Shanghai-based Foresight Fund, managed by Chen Guangming, said on Friday that it stopped accepting client subscriptions after blowing past its 6 billion yuan fundraising target. While the fund didn’t disclose the amount of orders it received, people familiar with the matter said they topped 70 billion yuan, including about 20 billion yuan via China Merchants Bank Co.’s fund distribution platform. Individual investors have piled into China’s $7.2 trillion stock market this year, propelling the Shanghai Composite Index to a 24 percent gain and buoying an asset-management industry that many see as the last big frontier for international firms like BlackRock Inc. and Vanguard Group Inc. Chinese policy makers have generally been supportive of the inflows, but they also want to avoid a repeat of the speculative frenzy that fueled the nation’s 2015 equity boom and bust. So far, investor sentiment has yet to reach the extremes of 2015. The consensus among forecasters surveyed by Bloomberg this month is that the Shanghai Composite’s gains will slow, with the index reaching 3,200 by the end of June -- a gain of just 3.1 percent from Friday’s close. But the rush into Chen’s Foresight Fund suggests overshooting is a risk. The product, which will invest 60 percent to 95 percent of its assets in equities, is the manager’s first offering since he left Orient Securities Asset Management Co. after two decades at the state-backed money manager. One of Chen’s old funds has gained about 700 percent since May 2009, trouncing a 32 percent increase for the Shanghai Composite over the same period. The Foresight Fund’s successful debut was driven by a “highly shrewd” sales and marketing campaign that made smart use of social media and will become a case study for international managers seeking to roll out products in China, Z-Ben Advisors, an asset-management research firm, wrote in an emailed note on Friday. BlackRock, Vanguard and JPMorgan Chase & Co. are among global firms that have pursued a bigger presence in China’s asset-management industry after regulators loosened foreign ownership rules. Chinese mutual fund managers oversaw 13.8 trillion yuan across 5,724 products as of January, according to the Asset Management Association of China. That’s an increase of more than 700 billion yuan from the end of last year. A Foresight Fund representative declined to provide more details on the fundraising.